Planning to undergo a cosmetic procedure? 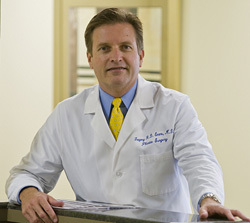 UCI Health plastic surgeon Dr. Gregory R.D. Evans recommends some advance planning and recovery preparation to achieve the best results. For starters, be sure to discuss your medications with your doctor in advance, says Evans, director of UCI Health Aesthetic and Plastic Surgery in Orange and UCI Health Pacific Coast Plastic Surgery in Costa Mesa. You also should avoid aspirin and anti-inflammatory medications for about seven to 10 days before an injection or other procedure. To limit bruising, avoid drinking alcoholic beverages for a day or two before getting Botox® or a filler, and for a few weeks before any surgical procedure, Evans says. To limit bruising and swelling after Botox or a filler injection, follow your doctor's instructions on applying ice packs to the area. Avoid smoking during recovery from any procedure. Avoid direct sunlight and use a high SPF sunscreen. Get plenty of rest, drink fluids and eat a healthy diet after surgery. See your doctor for all follow-up appointments. For more information or to schedule a cosmetic or plastic surgery consultation, call us today at 949-999-2411 or 714-456-3077.